Today has been one of the best. 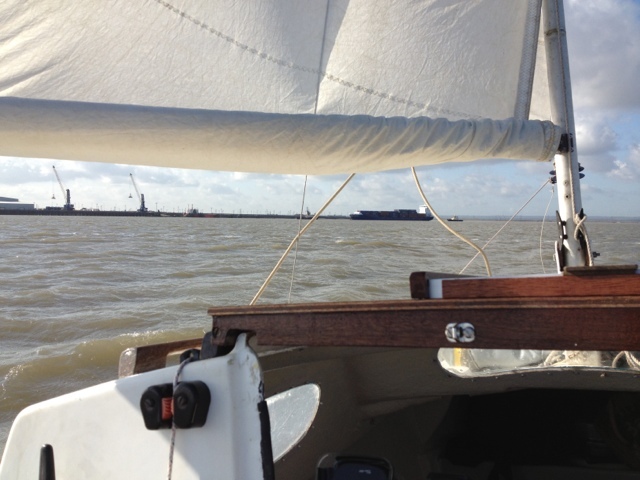 The sail from Queenborough around the Isle of Sheppey to the north, gave me the advantage of the last half of the ebb and a fair northerly force three to take me into the River Swale. 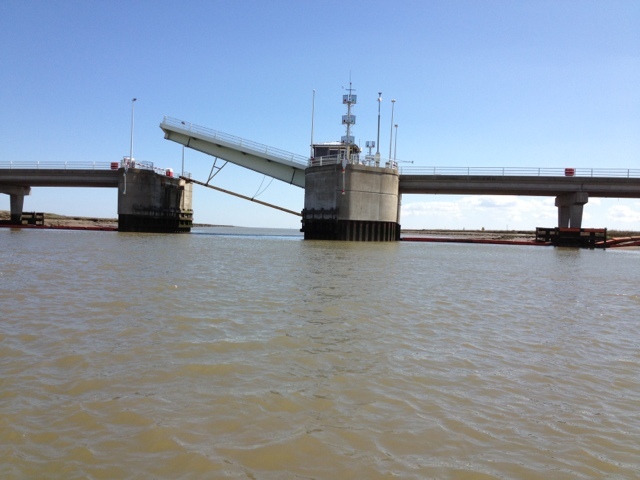 There at a mooring off Harty Ferry I waited until two hours before high water to enter Faversham Creek. Instead of going right up to Faversham I turned to starboard into Oar Creek. There were a couple of Thames barges berthed to port near the Shipwrights Arms. 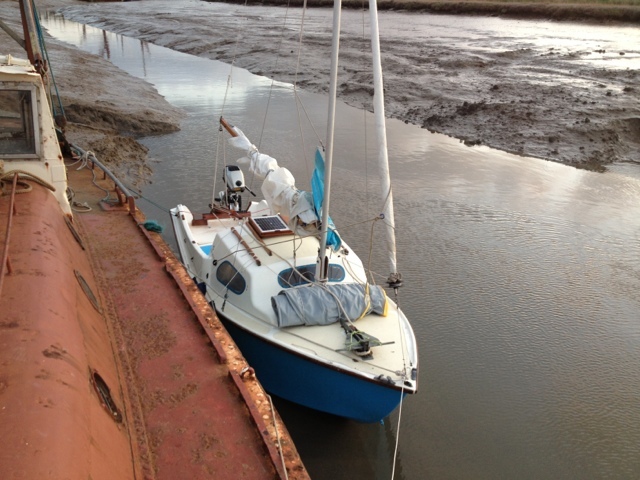 I chose to lie alongside a sleek yacht berthed in the mud. Then I made a quick getaway for Faversham town to obtain petrol and food. Fortune was on my side, because I flagged down a car and got a lift. At TESCO I found everything on my shopping list except AA batteries. A taxi brought me back to the boat, but she had been moved next to an old trawler. 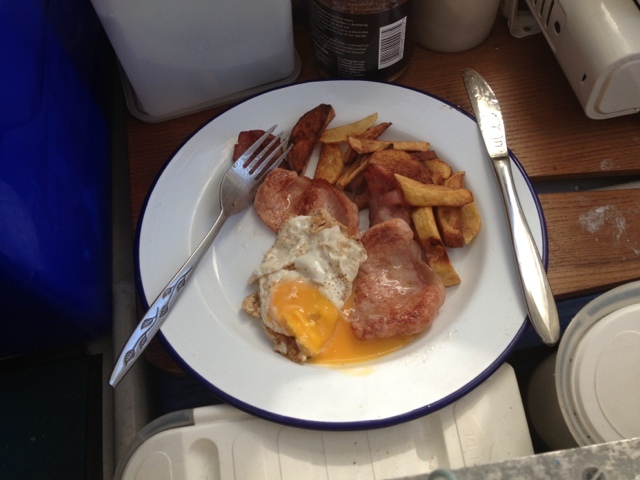 Meal time had me frying chips, bacon and an egg. 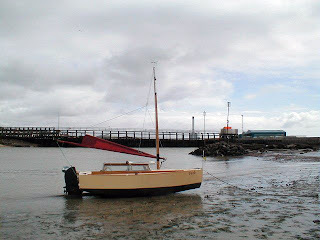 My intention was to visit the pub and do my blog there, but there was no way of getting ashore because at low water I couldn't climb the jetty without a ladder. Altogether the day has been exceptional. Yesterday at the end of the day's log I asked the question, "What will tomorrow bring?" Well, it is 16.20 and I have had a good time. By comparison with last night it has been bliss. 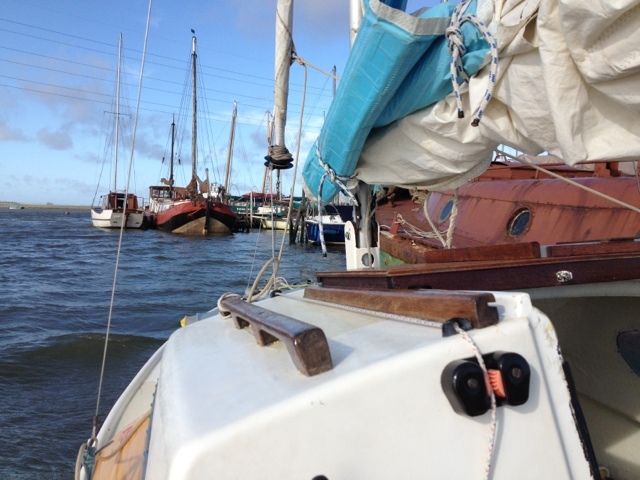 Anchored in Liegh Creek during a blow was a very uncomfortable experience. I didn't get any real sleep, and for most of the time I stood anchor watch. One trawler came up the Creek 30 minutes before HW. At the crack of dawn the sky was dark and foreboding, but I had business to do. 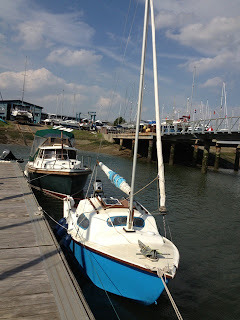 My endeavour was to cross the Thames to the Medway. There was a 3 to 4 from the NW which was just the ticket. I put one reef in the main and set a reduced jib. 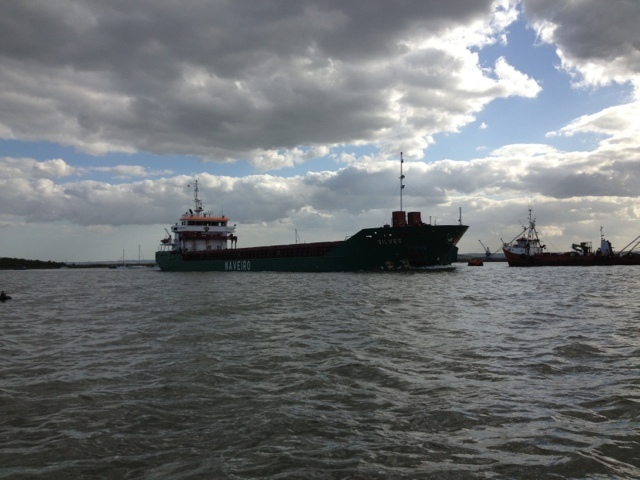 From Leigh Buoy right into Queenborough was truly exciting. Now and again I had to ease the sheets, and near the Kent side I had to put in a second reef. 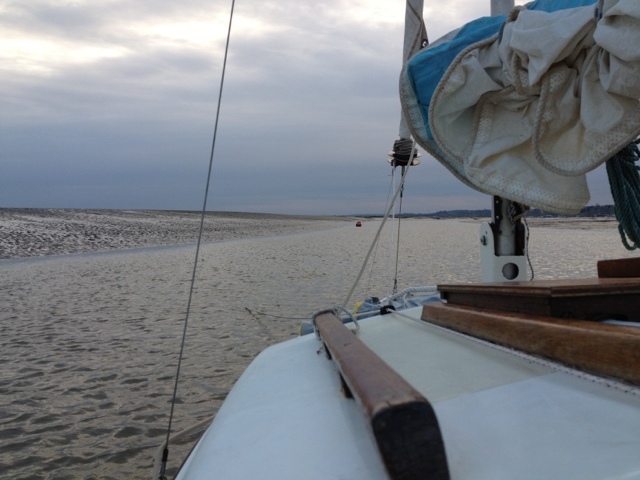 I took up the anchor at Leigh at 06.40 while a seal watched my every move. 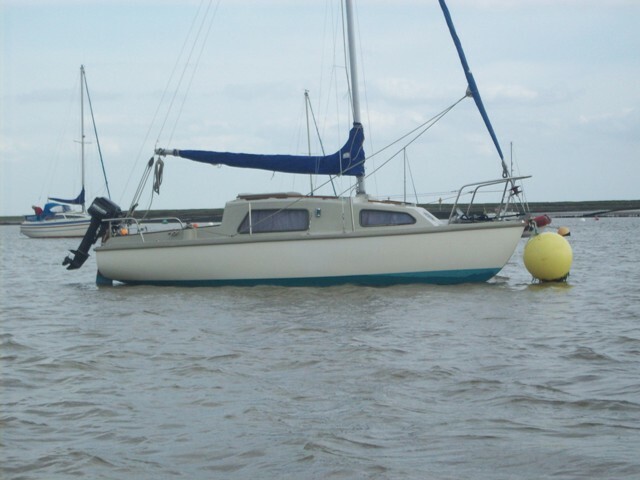 Two and a half hours later' Sandpiper' was secure on a Queenborough mooring. Since then I have had a nap and attended to several things that required attention. There is no immediate necessity to obtain food or water, but I only have 6 litres of petrol left; therefore a time ashore must be on the cards within a day or so. 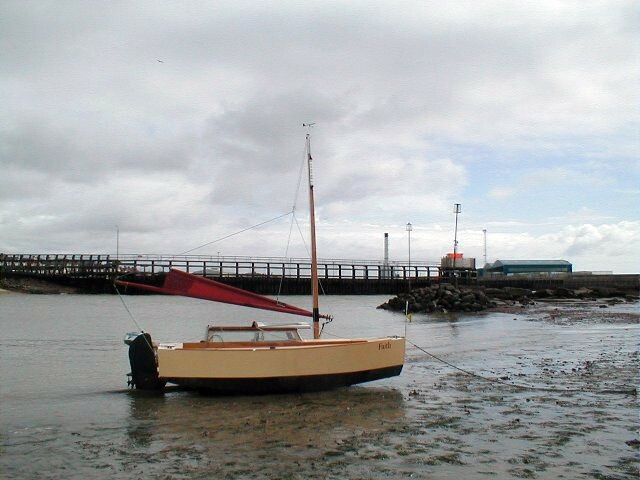 As I write this, the boat is just touching bottom in Leigh Creek. It was a close thing getting here via the Havengore Bridge. Timing was crucial. I calculated I would have to be underway at Yokesfleet Creek at 12.40 for time to arrive at the Bridge with sufficient rise for getting over Maplin Sands, about 12.50. That was the case, but there was a 10 minute delay because the lady who operates the bridge had not arrived. That left me 2 hours and 10 minutes of flood tide for making it to Leigh-on-Sea. As I expected from the weather forecast, the wind freshened from the SW, a header! Just before rounding Southend Pier the engine ran out of fuel. I refilled the tank, but I couldn't get it to start. There was only one thing to do, and that was to sail. Headway was not possible. I decided to head to a spot where two trawlers moor to the east of the Pier. However, I tried the engine again and it started. 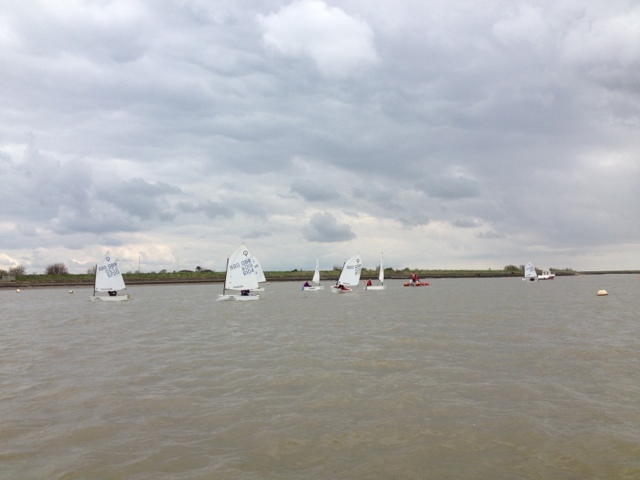 From there I was able to get 2 knots by motor sailing. From the Leigh Buoy the Creek was fairly easy to find, and the inner gut was well buoyed. As I finish today's log, 'Sandpiper' has settled on the bottom of the creek. I'm hoping for a reasonable night, although I'm expecting a Force5 and rain. Last night it was pretty cold on the boat, and I felt it. Only then did I realise I had forgotten to bring my thermals. I never sleep well on the first night of a cruise - it was no exception. Today I was up early in time for the shipping forecast - not that I had to listen to it - but I did it to rehearse for when I may have hear it. 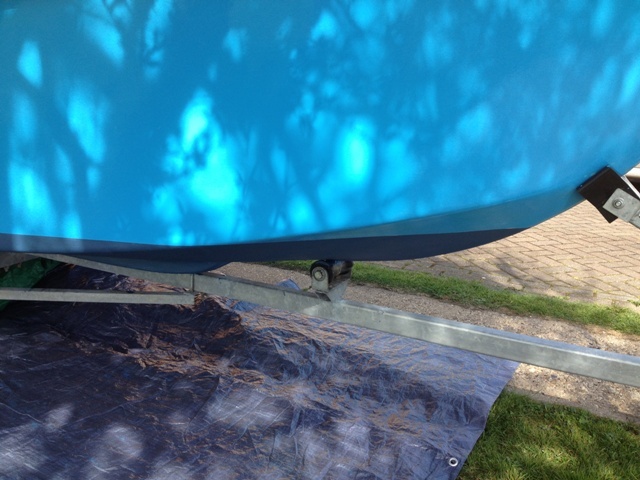 My first task was to sort out the furling jib which was achieved by tightening the shrouds. At 11.30 on the dot I cast off and sailed out of the harbour under jib alone. 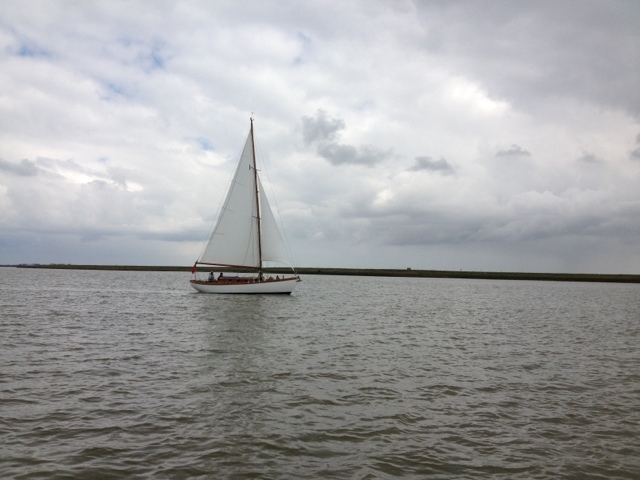 All systems were working; therefore I set the mainsail and headed towards the River Roach. On the way I passed three distinct flotillas of Optimists, the last of which I could not avoid, but sailed through without incident. At the entrance of the Roach 'Sandpiper' was joined by a beautiful Harrison Butler double-ender. We matched each other; both of us anchored in Yokesfleet Creek. The wind piped up, but I felt secure because the Creek was well protected, even at high water. I enjoyed the sun and made myself a cup of tea; then I called Shoebridge on the VHF to enquire about the earliest opening time for the Havengore Bridge. An inquisitive seal swam around the boat. At mid afternoon the wind increased yet again, and there was a light shower. Well, I'm hoping to sleep OK tonight, and as the forecast is for frost I'll have to wear an additional layer of clothing. 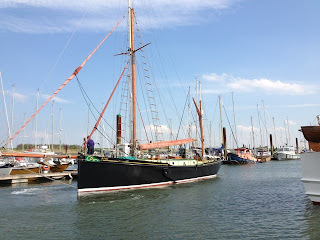 Yesterday I launched ‘Sandpiper’ at Burnham Yacht Harbour. As I was about to head home to attend to last minute business before starting my cruise, I paused to admire the sailing barge ‘Juno’. I believe she had refuelled, and she lay alongside the fuel pontoon. Her engine was started and her bow thrusters took her away from the pontoon. She moved forward well clear, and started reversing; then things went horribly wrong. 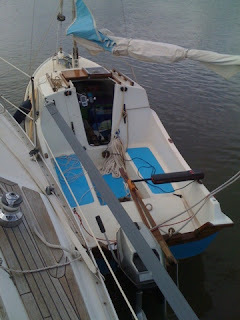 Instead of continuing stern first to exit the marina, her bow moved towards fuel pontoon that lay to leeward and her bowsprit struck one of the fuel pumps causing it to crumple and tipple to one side. ‘Juno’ continued reversing and scraped clear. Afterwards, she returned to the pontoon. Somehow the Harbour Master must have heard of the incident or saw what happened, because he smartly arrived at the scene. At that point, from where I was on the adjacent pontoon, I couldn’t see any fuel escaping from the pump. The matter was in hand, and as there was little I could do to help, I made my way to the car before returning home with ‘Sandpiper’s’ road trailer. Having eaten an evening meal, I hosed weed and salt deposits from the trailer and greased its moving parts. Finally, I put it in the garage, fitted the lock and secured the garage door. 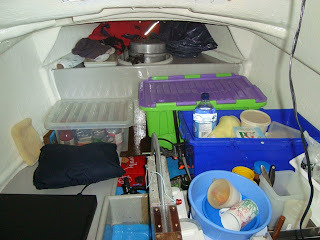 There, the trailer will remain until the end of my cruise, which may be a matter of days, weeks, or months. Just now, I’m going nowhere, unless I can sort out the furling jib. What is causing the problem is a mystery. I may have to tighten the shrouds to put more tension on the forestay, and I may have to reduce the tension on the luff of the sail. A bit of WD40 may help. Well, that’s the first thing I’ll have to attend to tomorrow morning. This Friday, 26th April, I’ll be having my first night aboard, which will be at the Yacht Harbour. 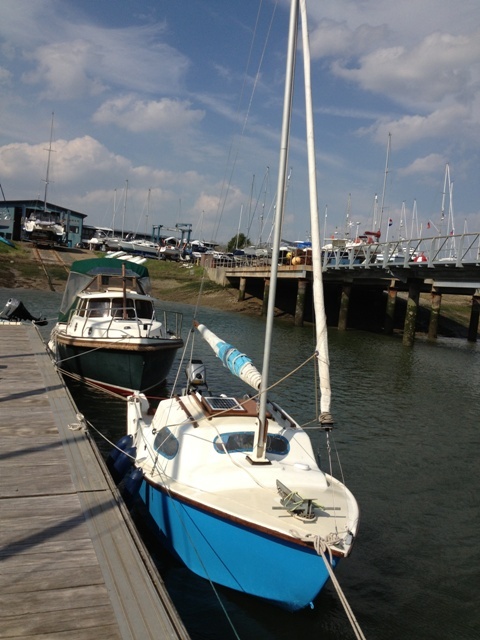 After arriving at Burnham Yacht Harbour there was an hour and a quarter before high water. 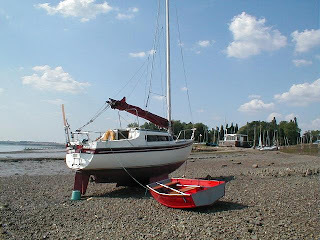 I started rigging the mast, and I was asked to move the boat to make way for the hoist. This is a huge mobile frame supported by large wheels like those of a tractor. The motorized vehicle has two strops for lifting and lowering vessels so that they can be transported and launched or retrieved from a structure that extends over the water. In all I took three quarters of an hour to prepare and launch ‘Sandpiper’ via the slipway. That was a record time for me. Normally, I give myself at least an hour and a half for launching. Ideally, I like to launch and retrieve my boat shortly before high water to avoid mud and weed that lurks around the low water mark. 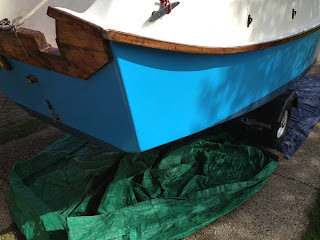 The wind was blowing onto the slipway which was a help to begin with, because it kept ‘Sandpiper’ snugged to the side of the slipway, allowing room for the trailer to be towed clear. 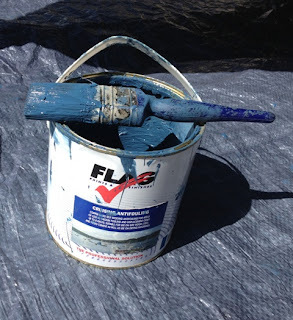 I used a rope to let the trailer into deep water so that the boat could float clear while I held a long painter. 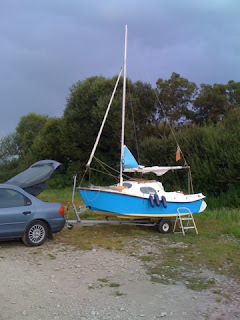 Having parked the trailer and car I pushed the boat into the wind and climbed aboard. Immediately I grabbed the paddle and stroked three times each side of the boat. As long as I kept the momentum by paddling in this way I could make headway to a pontoon where I disembarked. 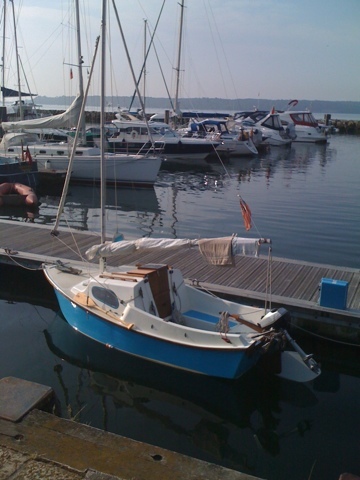 From there I was able to tow the boat around a stationary motor yacht to a pontoon allocated by the Harbour Master. After lunch I set up the jib and main. I discovered that the jib was not rotating as freely as it should. 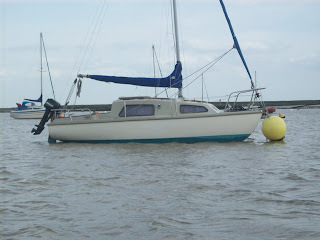 I’ll have to solve the problem on Saturday before I take the boat for a trial sail. I tested the engine and bought a lock for it. Well, it looks as though I’ll be making a start to my cruise on the weekend. The forecast for Saturday looks pretty good, with only a few showers around mid-day. Tonight and Friday there will be rain. It’s just as well I left the cockpit drain bung out. After cutting the lawns and trimming the hedge I was ready for the insurance assessor. He arrived at 13.30 and he took half-an-hour to do a thorough investigation of the plumbing incident that happened on Monday. The upshot is that the kitchen ceiling will be repaired and the whole kitchen will be repainted to match the new paint that will cover the stained wall. I shall have to pay an excess fee which may be less than the cost of putting things right. After the insurance assessor left, I had the remainder of the day to sort out the boat and make her ready for launching. 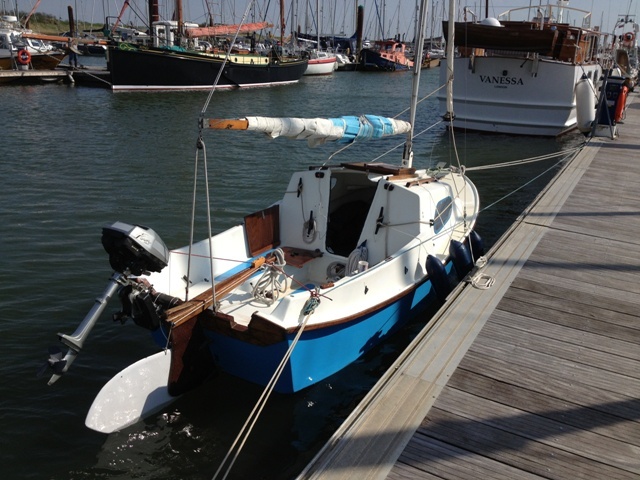 Hopefully, I’ll be able to take her to Burnham Yacht Harbour on Thursday morning after an early shopping trip to buy food, some of which will be stowed aboard before I hit the road. The car has to go into the garage on Friday for a service, which means I shall not be able to set off from Burnham until the weekend. The forecast gives showers on Saturday morning, and Sunshine on Sunday. At last, the deed has been done! ‘Sandpiper’s’ bottom has been coated with Flag Cruising Antifouling. Tarpaulin to protect the driveway - ready to start. Done, but masking tape still in place. My plan today was to apply antifouling to ‘Sandpiper’s’ hull, but fortune would have it, as I was doing the ironing, prior to working on the boat, my wife called me to the kitchen. By the tone of her voice I knew there was something wrong. She pointed to a damp patch on the wall. I traced the source to a point under the ceiling, almost directly below the upstairs toilet. An inspection of the flexible pipe for supplying water to the toilet cistern suggested to me that it was perished near the upper end; hence the leak. I attempted to turn off the mains stopcock, but it did not fully stem the flow. I opened the lowest tap which was in the kitchen. This effectively stopped water rising to the leaky pipe; therefore I was able to remove it and take it to a builders’ supplier as a pattern for a replacement. Back at home I fitted the new pipe and opened the mains stopcock, but at the upper end of the new flexible pipe the leak was as bad as ever. I turned the handle of the stopcock to stem the flow. Horror of horror, water continued flowing through the pipe! The stopcock was totally ineffective. The answer was to turn off the inflow at the water meter which was outside the house. The chamber containing the meter and the mains tap was flooded! I had to remove the water before I could turn off the tap. Mercifully, the meter stopped ticking and the flow was stopped. Time for doing this job without help had passed. I urgently required a plumber. Two hours later he arrived. He refitted the new flexible pipe and turned on the water. To his surprise there was still a leak where the pipe entered the cistern. Another examination revealed that the plastic fitting to which the flexible pipe was attached, was cracked. 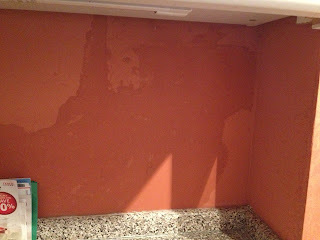 Having installed a new fitting, he tried once again, but water started dripping from the ceiling! All of this activity had shifted the down pipe that entered an elbow joint below the bathroom floor causing it to be dislodged. 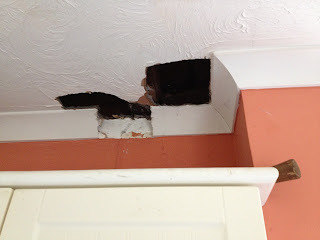 For the plumber to get at the joint, parts of the ceiling had to be removed. With my help he managed to fit a new joint. Altogether he took 1 ½ hours to fix the plumbing. I was charged £252.12, which included the cost of new parts. Divine providence enters the equation, because I am glad this has happened before setting off on my cruise with ‘Sandpiper’. 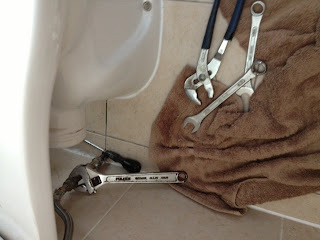 All the plumbing has been renewed and it should be good for years to come. Maybe I’ll get the antifouling on the boat soon. There's no nautical blog today. I am otherwise engaged. The food is very good, however. Anon. Last year I thoroughly tested ‘Sandpiper’s’ two GPS units, and most of my navigation around Poole Harbour was verified by them. I invariably had the Harbour chart spread out in the cockpit or on the port bunk in the cabin for immediate reference. 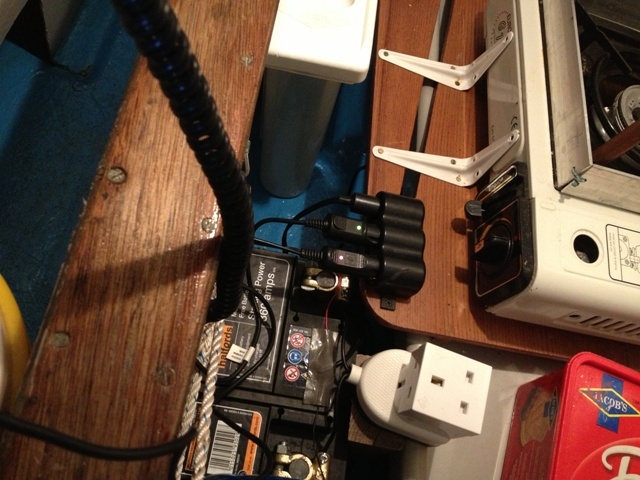 Electrical input for the GPSs was from the ship’s battery that relied upon a solar panel for topping up. This year I have a slightly smaller solar panel, but I think it will suffice. 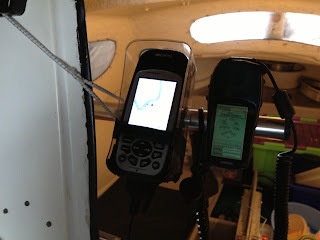 Yesterday, in preparation for the forthcoming cruise, I replaced the battery beside the centreboard box and I connected the GPS units to make sure they were working. Using the Almanac I updated the positions of buoys that Trinity House had moved over the winter months, and I checked the input data for every waypoint I previously programmed into the Garmin Etrex. When out on the water I use the Etrex for navigating and the Lowrance for visual confirmation that my courses are correct. 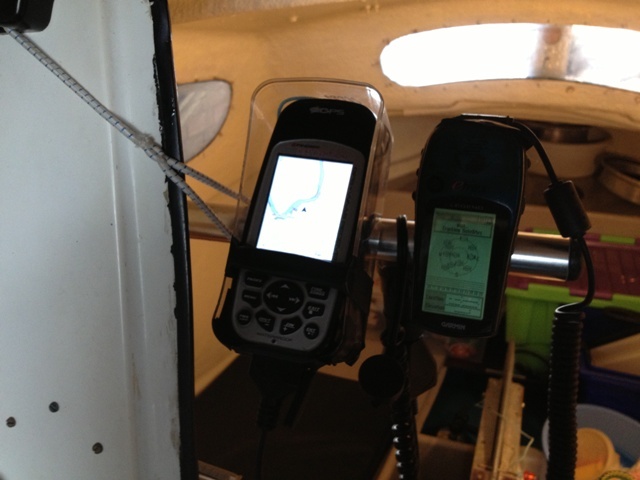 If for unexpected reasons both GPS units fail, I have a good navigation programme* on my iPhone. 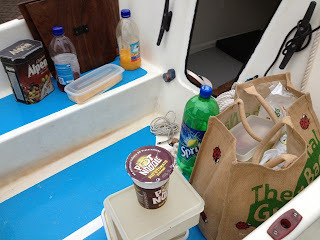 In addition to attending to the GPSs, I cleaned the interior of ‘Sandpiper’ and threw away outdated tinned food. 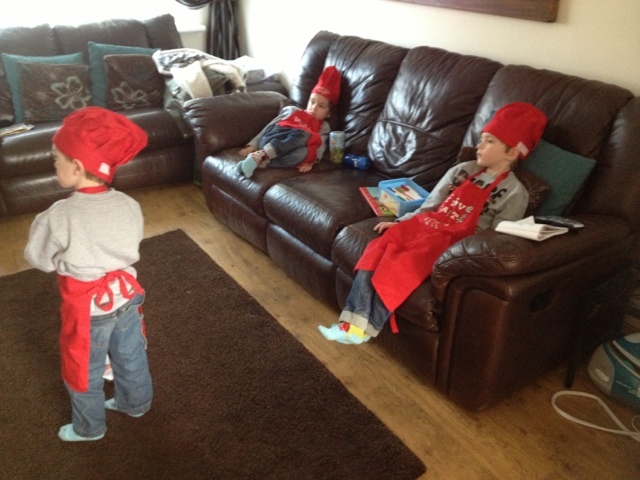 I tried the hob and scoured pots and pans, cutlery, plates etc. If I had not been visiting relatives today I would have antifouled the boat. The weather was perfect with not a cloud to be seen, but that’s how things go. Tomorrow, due to commitments, I shall not be able to apply the antifouling. Maybe I’ll be able to do it on Monday - the sooner the better, because I would like to launch ‘Sandpiper’ for a trial sail. In addition to the wind-up lantern featured in yesterday’s article, I have five other lamps/torches. The smallest is a water resistant mini-torch. It is powered by an ‘AAA’ 1.5 volt battery. 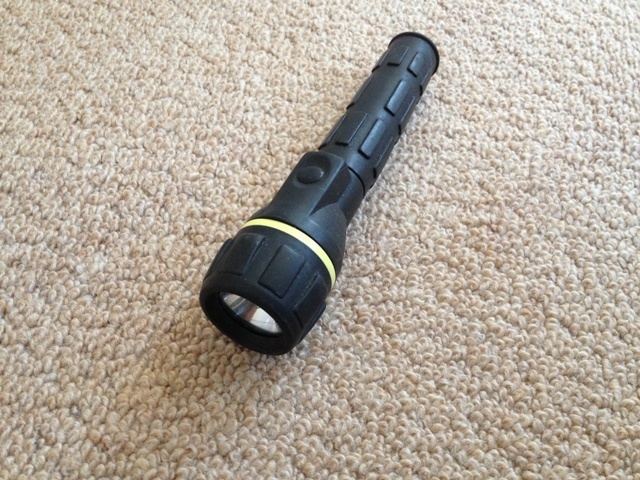 This is a really useful torch with an adjustable beam. I can carry it in my pocket which is very handy when night sailing. 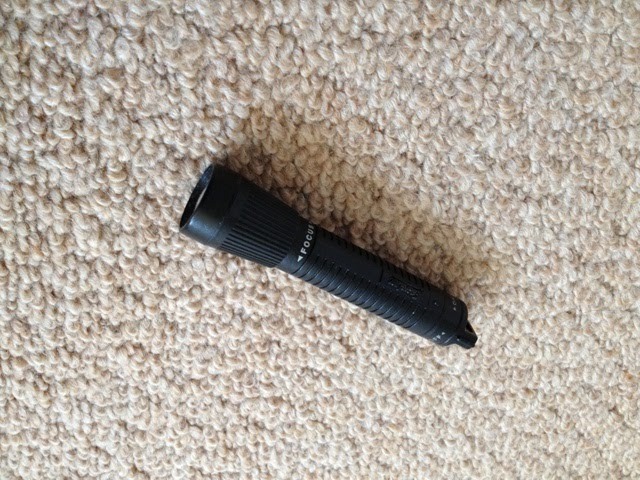 I like the torch because it creates hardly any glare, and the battery lasts for ages. My favourite lamp is a small one that can be strapped to my forehead by an elasticated support. Pressing a button once illuminates 2 LED lights; pressing it twice illuminates 2 more, and pressing it a third time activates all 6 lights. A final press of the button turns them off. The advantage of this lamp is that my hands remain free, making it ideal for when I do things like chart work and writing up the log. I have an ordinary pocket torch that is good to have around when I’m out at night, either when on the tender or ashore. With it I can make my presence known to others, and I can search for possible hazards such as rocks, stones or stakes. 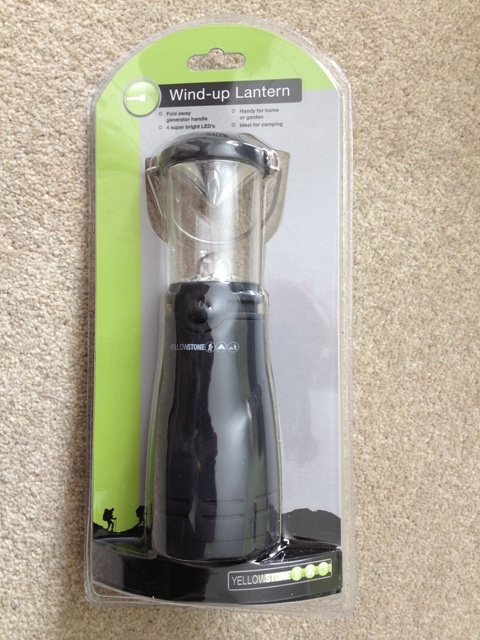 I have an all-round lantern that is powered by 4 ‘AA’ 1.5 volt batteries. With it the entire cabin can be illuminated and it can double up as an anchor lantern. The most powerful lamp is the one reserved for scaring off vessels. By shining it on ‘Sandpiper’s’ sails I can make her more visible. If things look really grave, perhaps in a collision situation, I can aim the beam directly towards the bridge of a ship. I can also communicate by Morse code. Mostly, I shall avoid night sailing, but inevitably I shall find myself working the boat after sunset. I have a total of 6 lamps/torches available for use aboard ‘Ladybird’; therefore if one fails there are alternatives. 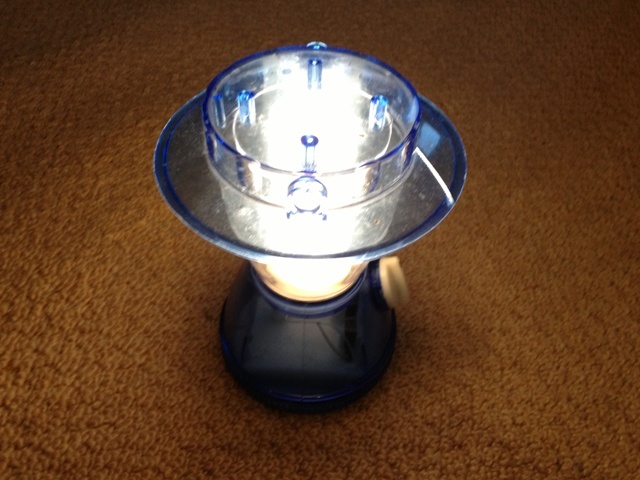 The most recent addition is a Yellowstone 4 LED Wind-up Lantern. 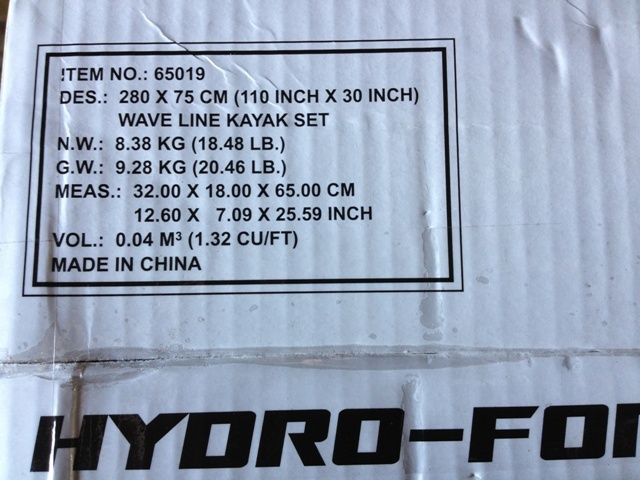 I saw it at Camping General when I bought my inflatable kayak. It will be ideal for lighting the interior of the boat. 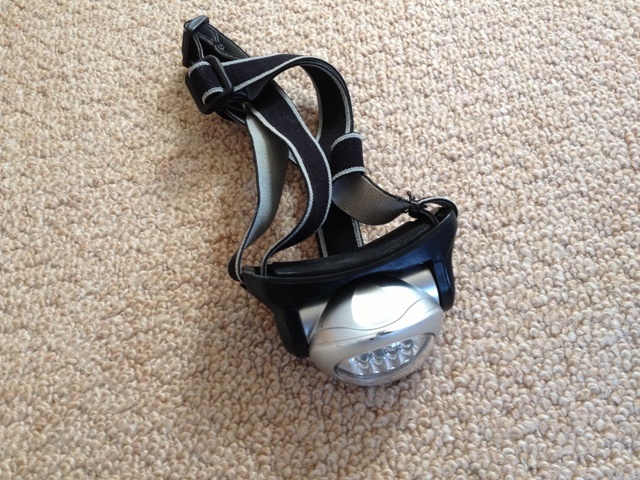 I could also deploy it as an anchor light. 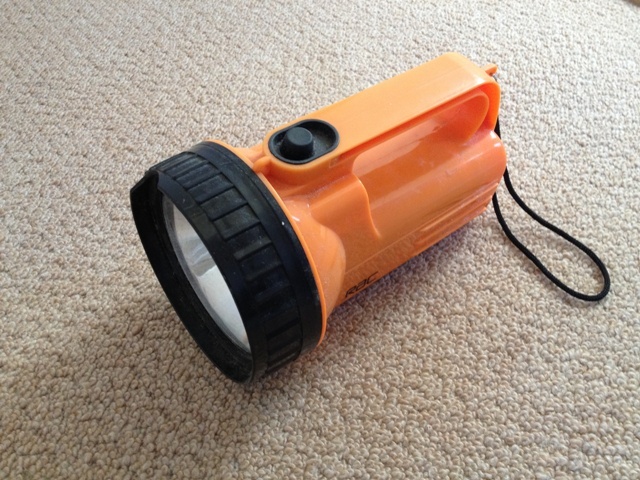 Compact and lightweight, measuring 200 millimetres x 65 millimetres, the output with 4 LED lights should be sufficient to be seen a mile or so away, especially as it has an inverted conical reflector multiplying the source by 100%, i.e., the equivalent of 8 LEDs. 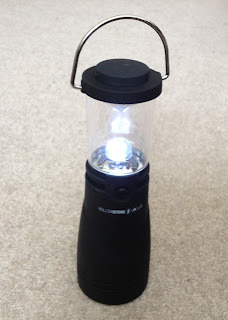 I’m a little dubious that a fully charged battery will keep the lantern working for 8 hours, which could be required when used as an anchor light during the summer months. The makers claim that one minute rotating the handle will provide sufficient charge for 30 minutes. At that rate I would have to wind the handle for 16 minutes! The 360 degrees lantern is supposed to be water resistant. I feel sure it has been the warmest day of the year so far. The afternoon sun inspired me to clean the exterior of ‘Sandpiper’. I put her on the driveway and gave her a good scrub. 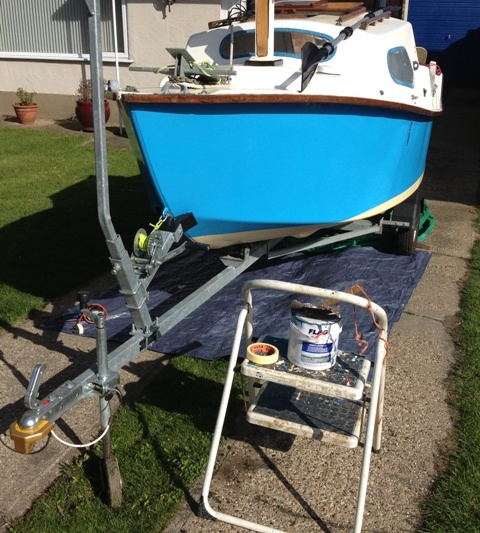 She’s ready for a coat of antifouling. Normally I would not bother antifouling a trailer sailer that is afloat for short periods, because marine growth cannot get a hold on her in a matter of days, but my intention is to keep her in the water for as long as my forthcoming cruise may take - that could be up to two months or more! I know my plans are ambitious, but unless I give myself a challenge, perhaps very little will be achieved. Over the next few days I must stow gear and provisions and check everything. 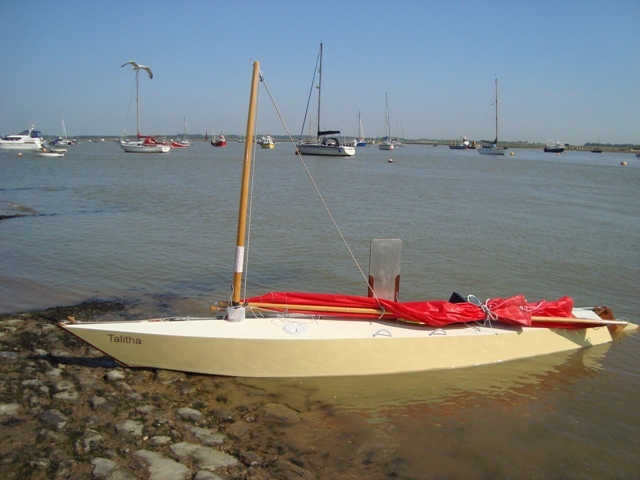 Because my calendar is unexpectedly full until late April, I doubt I shall be able to start the cruise until then, but I may be able to launch ‘Sandpiper’ and have her ready somewhere on the River Crouch, probably Burnham Yacht Harbour. This will be very convenient, because getting aboard with last minute items will be a simple matter, and if she is waiting at a pontoon I shall be able to depart when tide and wind allow. This time I am hoping I shall be able to visit a few places I haven’t been to before. Going through the Havengore from the River Roach would be good to try before crossing the Thames to the Medway. From Queensborough maybe I could take the passage south of the Isle of Sheppey to the eastern River Swale. A visit to Faversham would be good, and from there to Whitstable. Whether I’ll do any of these things remains to be seen. Wind, tide and weather will determine what happens. I would consider an exploratory detour up the Thames to London before heading for Dover. It would add several days to my cruise, but if I find I’m not up it physically or mentally, or there are shortfalls with the boat, I would not be far from home. An adventure is an undertaking, the end of which cannot be guaranteed. This is what excites and stimulates those who enjoy adventuring. You don’t need to go to the South Pole or remote regions of the earth to have adventures, nor do you have to spend fortunes to experience them. For an adventure to have zest there should be a personal challenge by way of difficulty, and for some, there must be an element of risk to life or limb. I am looking forward to my adventure. Last year when I was at Poole Harbour cruising ‘Ladybird’ there were times I wished I could have left her at anchor and ventured ashore with a tender. Unfortunately I did not have one. 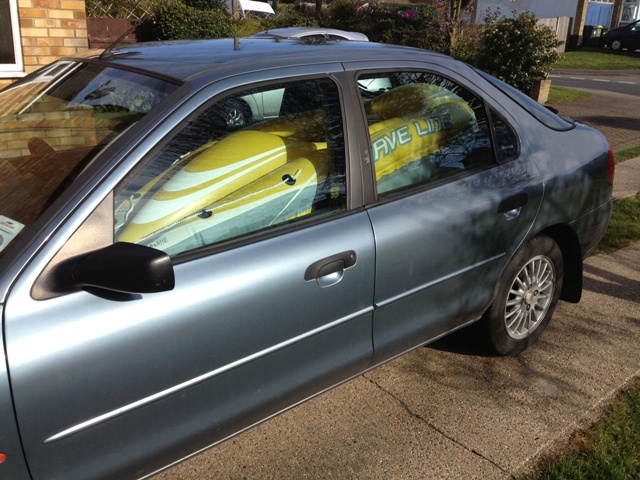 There was just about enough space for stowing the smallest of pump-up dinghies. Unfortunately, my WavEcho dinghy did not fit the bill because it was too large and too heavy. Prior to buying the WavEco for use as a tender to ‘Ladybird’ I did a bit of research looking for suitable inflatable tenders, and I came to the conclusion that a one man inflatable dinghy would be better than an inflatable kayak. 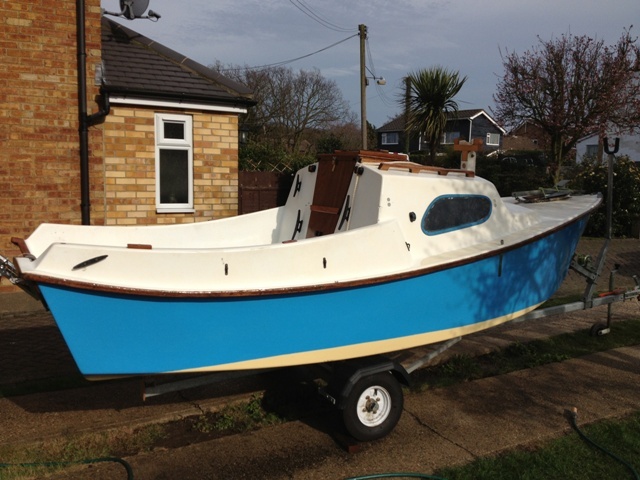 However, now that I no longer own ‘Ladybird’ and my current boat ‘Sandpiper’ is considerably smaller; the only alternative would seem to be a cheap, lightweight inflatable canoe. 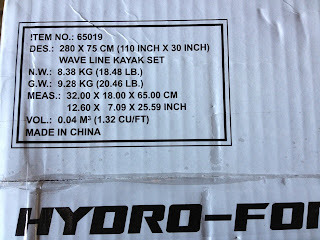 Therefore I have bought a 110 inch by 30 inch Wave Line Hydro-Force inflatable kayak. I have yet to try her on the water. Inflating her for the first time took considerably longer than I anticipated. In fact, it took a quarter of an hour! No doubt, as I become familiar with the process I shall knock minutes off that time. 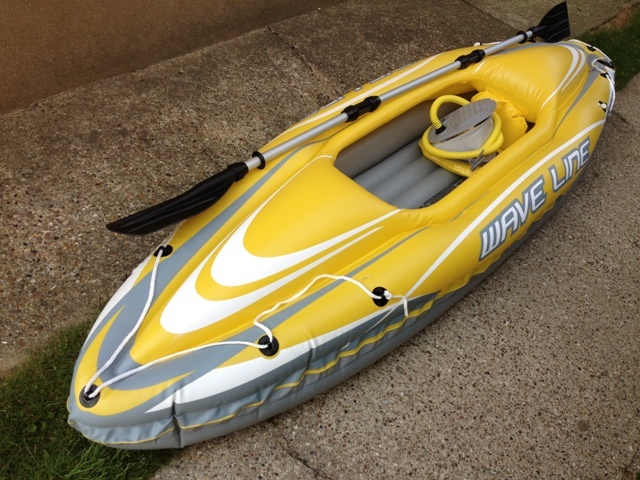 It would appear to be robust enough for my purpose, but the manufacturer gives various warnings, particularly not to over-inflate the kayak or leave it in the sun. Her double-bladed paddles can be assembled from component parts. Fortunately I have a spare dinghy pump, because one wasn’t supplied with the kayak. Under her bow there is an eye for attaching a painter, and providing it’s not too windy and the water is not choppy, I think I shall be able to tow the kayak behind ‘Sandpiper’. 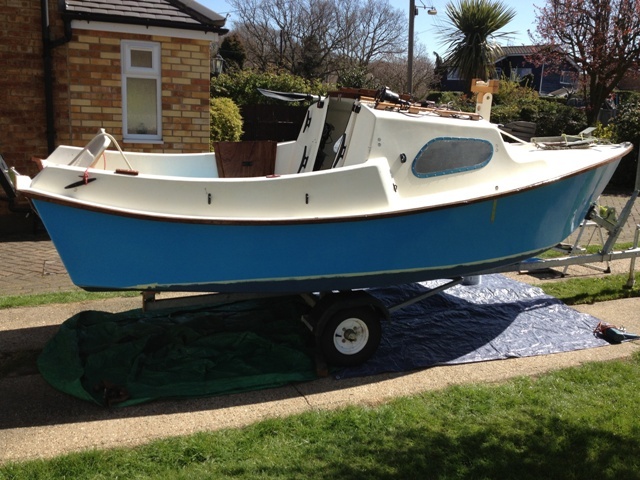 I have owned ‘Sandpiper’, my ‘C’ Type West Wight Potter, for approximately twelve months. I had hoped to take her on an extended cruise last year, but several things transpired against it. Firstly, after buying the boat I discovered she had major faults, the most serious being disintegration of the centreplate box in the region of the retaining bolt. 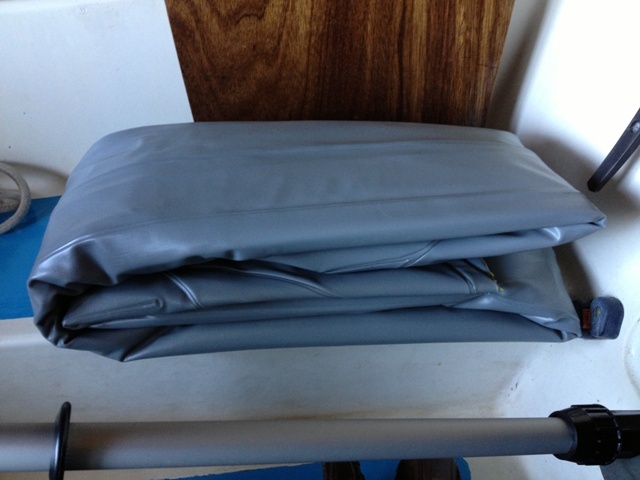 Surprisingly the furling jib was too large, which meant I had to re-cut and sew it. The mainsail was falling apart; therefore I had to repair it with new sail cloth. There were more deficiencies such as the standing rigging which was too short and her centreplate required re-galvanizing. I gave her a solar panel and fitted an Autohelm 800. Before the end of April this year I’m hoping to set off on a cruise that will last several days, and if all goes well it could be weeks rather than days before I return home. Two factors will determine the length of my cruise: the weather and my ability to make a go of it. I take nothing for granted. 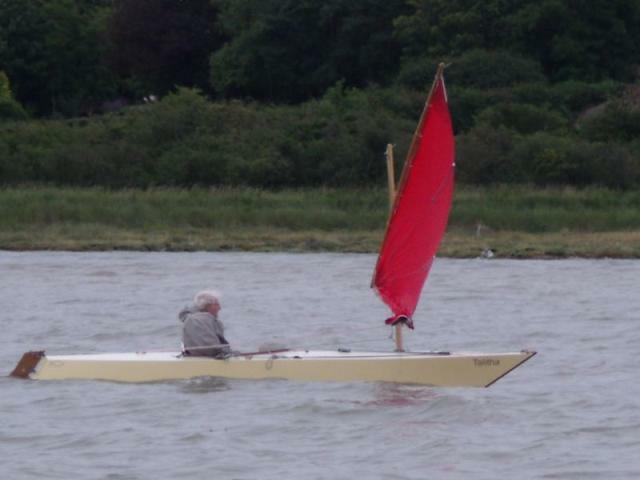 ‘Talitha’ was the most radical of the boats I have built and owned. What in part made her so very different was her extreme drop keel having laminated fish-shaped lead ballast bolted to the tip. This made her virtually uncapsizable despite her narrow beam. 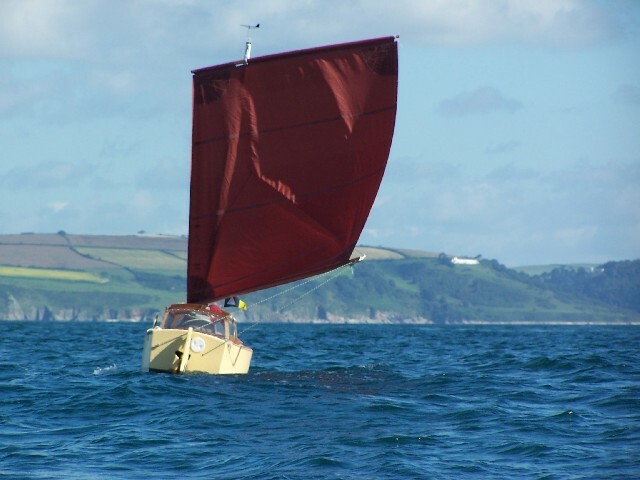 Another unusual feature was her lateen sail which was very efficient on all points. Spilling wind from the sail was easily done by easing the sheet which gave curvature to the sail, instantly reducing drive. Hence it was perfect for when the wind was gusty. The single set of reefing points reduced the sail area for the stiffest of blows. She was tremendously exciting to sail because the helmsman sat low facing forwards, and the proximity of the water gave an increased sense of speed. 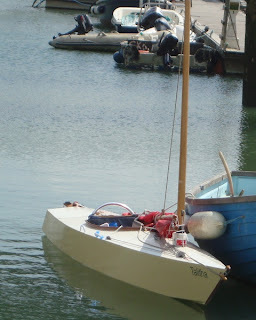 Steering was by foot bar with lines attached to a yoke fitted the rudder. She could be propelled with a single-bladed paddle. I had hoped I would be able to carry lightweight camping gear for undertaking short cruises, but in practice this did not work and I found that launching and retrieving her from a road trailer was not easily done. The main drawback was the weight of her keel, the ballast being comprised of two laminated parts, each about 40 lbs. 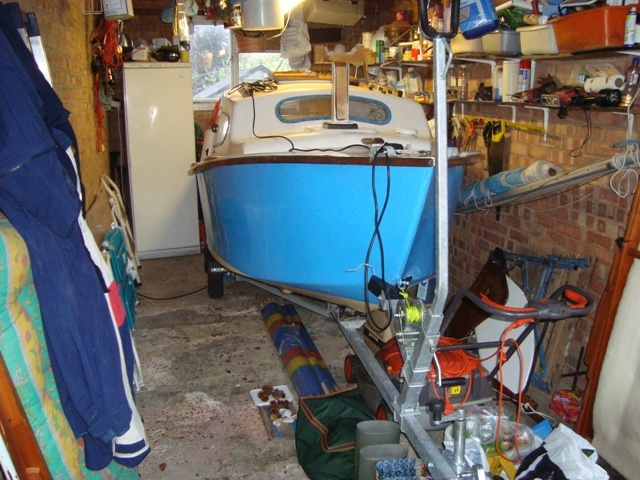 The keel had to be slotted into place while the boat was on her side and one of the lead ballast weights had to be bolted to the other that was permanently joined to the keel. 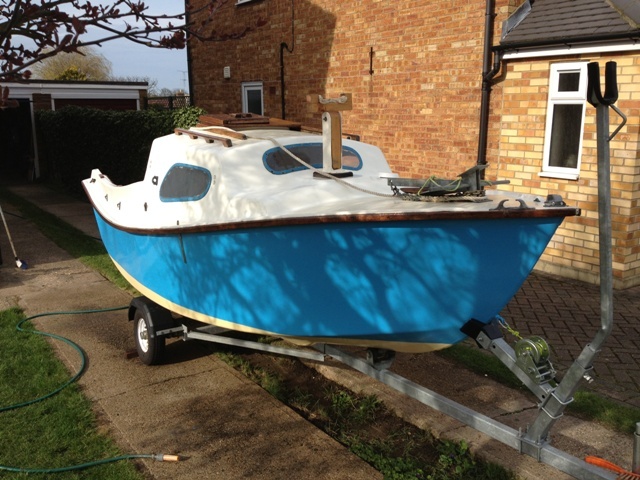 As a fun boat on a lake or river she would have been excellent for racing around the buoys. Her performance was by far the best in terms of speed and pointing ability of every boat I have built. Beaching her had to be done with care for fear of damaging the lead ballast. Landing on a sea beach where there might be surf was totally out of the question. Getting her up a shelving sand beach would have been difficult on account of her weight. Sand and gravel entering the keel box would have caused problems because the tolerance between the box and the keel was minimal, no more than 1/8 of an inch. There is no doubt in my mind that she was a super little boat, but she was not suitable for camp cruising as I supposed she would be. 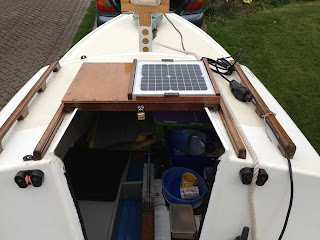 I didn’t keep her for long, but she gave me great satisfaction when building her and when I was out on the water. 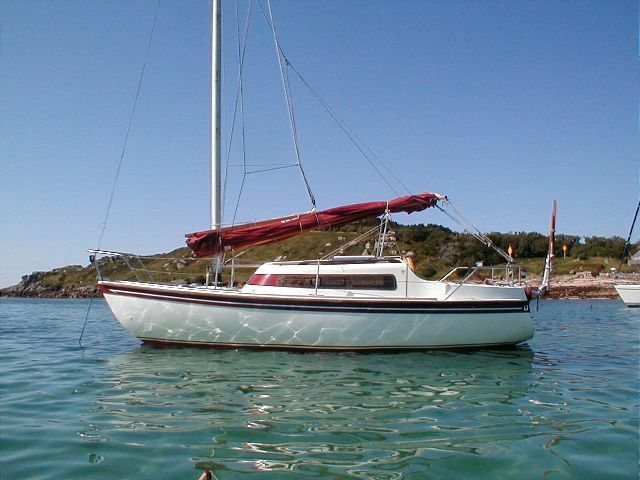 One of the more endearing yachts I have owned was ‘Ladybird’. 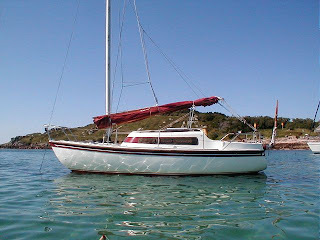 She was a 19’ Seawych twin keel sloop with remarkable accommodation for her size and a far better sailing performance than her chubby looks may suggest. The secret was always to have the correct amount of sail for the current wind strength and to never try pinching to windward. 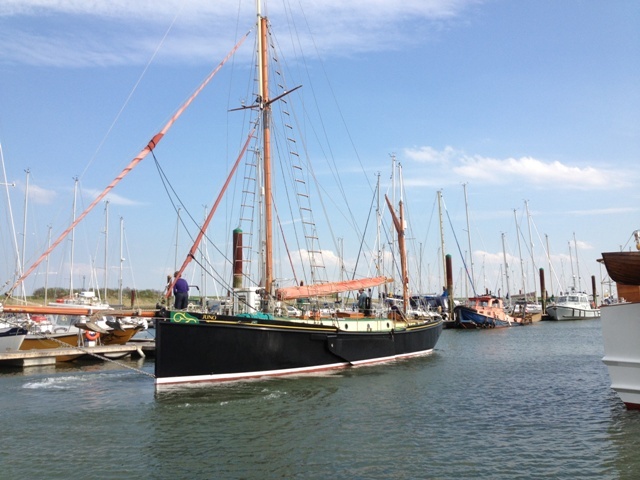 As a testament to her sea keeping ability I sailed her to Falmouth and back from the River Crouch. She went through some pretty rough water around Portland Bill and came out of it unscathed. 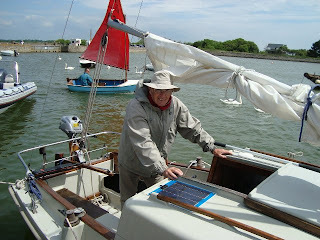 In addition to cruising her for two months along the South Coast I had many fine local cruises and day sails exploring the East Coast Rivers north of the Thames Estuary. If you are interested in reading about these adventures find the search box at the bottom of this page and enter the word Ladybird. This will bring up numerous links. Once again I was tempted with a bigger boat; this time by a junk-rigged Newbridge Virgo Voyager. She was quite the most luxurious yacht I have owned. Everything was of good quality and she had excellent standing headroom throughout. Her name of ‘Bumper’ caused some amusement to others, for whatever reason I never did fathom. She was a comfortable, forgiving yacht that could tolerate any amount of mishandling; for example if a gybe was not controlled, or she gybed involuntarily, nothing woe betide would happen; the boom being very light, simply lifted a little and swung across to the opposite side of the boat. She seldom heeled more than a few degrees when on the wind, but at times, particularly if the water was choppy or the waves short, progress was slow. On the reach and the run she was pretty fast. Her triple keel configuration was excellent for taking the ground. 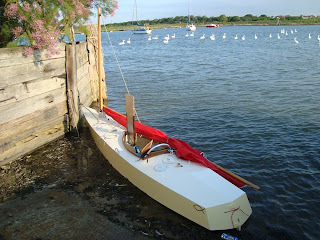 After two years of ownership I sold ‘Bumper’ and set about building a Paradox micro-sailboat designed by Matt Layden. 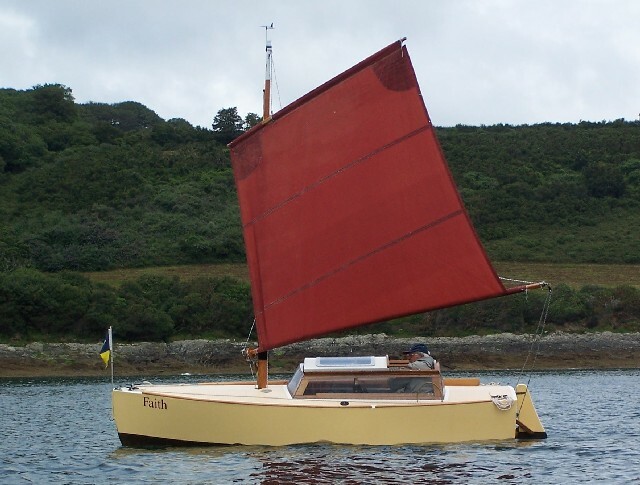 On reflection ‘Faith’ was perhaps the best boat I ever owned; maybe a trifle small, but so well thought-out for ease of working. Being able to control and steer the boat from inside a snug watertight cabin was a huge bonus. The only time I wore waterproofs was when going ashore if it happened to be raining. I could always be warm and dry whatever the weather. If it was really cold, I simply put on more layers of clothing. Sometimes the ventilation system was overpowering, but a towel stuffed into the incoming vent was enough to keep it under control. Of all the boats I have owned, ‘Faith’ was the only one I regretted parting with. Without 'Faith' I was lost, and to get back on the water I bought an Acadia decked canoe to which I added a small sail, a leeboard and a rudder. Appropriately, I named her ‘Acadia’. She was highly portable and good fun, but I never really felt completely relaxed sailing her because I feared I might let her capsize. I knew I would have difficulty getting back into her, and because I have Raynaud’s phenomenon that causes lack of circulation when I’m exposed to the cold, I thought it was prudent to part with her.